The "feel" — or how a pastel releases to paper — depends on the individual pigments used and the base they’re mixed with. 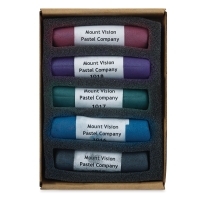 Karl Kelly, the owner of Mount Vision Pastel Company, understands that. By combining his technical expertise and artistic background, Kelly has translated the vivid color and unique density of individual pigments into high-quality, affordable pastels for the artist who sees beyond the expected when it comes to color. Each hand-rolled stick contains a unique combination of traditional and synthetic pigments, combined to bring out their inherent beauty, enrich their undertones and make each color sing, both individually and together. Combined in varying degrees with marble dust, chalk and clay to assure a consistently smooth and buttery feel, colors lay down with minimal resistance, allowing several layers to accrue without becoming too thick. Each stick measures 2½" long × ½" diameter (64 mm × 13 mm). Workshop Supplement, Set of 25 — A 25 piece supplement to the 50 piece Workshop Set. Workshop Supplement E Plein Air, Set of 25 — A 25 piece supplement to the Workshop Set, for the landscape painter. Workshop, Set of 50 — An all-purpose set containing all the colors artists really need. The selection is weighted toward darker colors that have a tendency to mix well. Landscape, Set of 25 — This set contains 25 colors unique from the Workshop Set, developed for the landscape painter. Workshop Supplement D Figure/Portrait, Set of 25 — This set contains 25 colors unique from the Workshop Set, developed for the portrait painter. Basic, Set of 25 — This set contains 25 colors unique from the Workshop Set. Chromatic, Set of 25 — This set contains 25 high-key colors — like having a color wheel in a box! Thunderstorm Gray, Set of 25 — This set contains a great selection for painting dramatic skies. Tropical, Set of 25 — This set includes 25 tropical colors developed for painting bright and sunny landscapes. This set contains 1015 Iridescent Black, 1016 Iridescent Dark Blue, 1017 Iridescent Dark Green, 1018 Iridescent Dark Purple, and 1019 Iridescent Dark Red. This set contains Green Earth 280, Reddish Orange 406, Dirt Yellow Green 530, Burgundy 300, Deep Red Purple 250, Brick Red 370, Blue Violet 330, Winter Blue 340, Gray Violet 230, Cool Turquoise 30, Blue Gray 260, Dark Green 390, Dark Green 391, and Dark Green 392. This set contains Dark Brown 580, Dark Brown 581, Dark Brown 582, Dark Brown 583, Dark Brown 584, Warm Gray 450, Warm Gray 461, Dark Red Brown 690, Dark Red Brown 691, Dark Red Brown 692, Dark Red Brown 693, Dark Earth Green 700, Dark Earth Green 701, Dark Earth Green 702, and Dark Earth Green 703. This set contains 1000 Iridescent White, 1001 Iridescent Light Yellow, 1002 Iridescent Yellow, 1003 Iridescent Orange, 1004 Iridescent Red, 1005 Iridescent Salmon, 1006 Iridescent Red-Violet, 1007 Iridescent Blue-Violet, 1008 Iridescent Golden Brown, 1009 Iridescent Copper Red, 1010 Iridescent Purple, 1011 Iridescent Blue, 1012 Iridescent Turquoise, 1013 Iridescent Green, and 1014 Iridescent Yellow Green. This set contains Dark Green 390, Earth Orange 311, Earth Orange 314, Raw Sienna 440, Blue Violet 331, Steel Blue 143, Green Earth 280, Cool Grass Green 61, Light Yellow Green 120, Dirt Yellow Green 530, Deep Red Purple 250, Winter Blue 341, Steel Blue 141, Phthalo Blue 82, Blue Gray 261, Geranium Pink 383, Geranium Pink 380, Flesh Ochre 191, Brick Red 371, Reddish Coral 101, Unbleached Titanium 40, Unbleached Titanium 43, Buttercup 290, Goldenrod 271, and Goldenrod 273. This set contains Purple blue 520, Purple Blue 521, Purple Blue 522, Purple Blue 523, Purple Blue 524, Midnight Blue 540, Midnight Blue 541, Midnight Blue 542, Midnight Blue 543, Thunderstorm Blue 644, Winter Blue 340, Winter Blue 341, Winter Blue 342, Winter Blue 344, Cobalt Blue, 430, Cobalt Blue 431, Cobalt Blue 432, Cobalt Blue 433, Cobalt Blue 434, Phthalo Blue 80, Phthalo Blue 81, Phthalo Blue 82, Phthalo Blue 83, and Phthalo Blue 84. 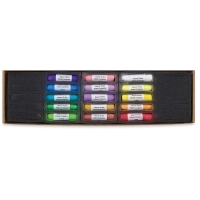 This set contains Blue Green 70, Turquoise Green 630, Soft Chromium Oxide 50, Yellow Orange Green 360, Yellow Purple 562, Phthalo Blue 80, Cobalt Blue 430, Cornflower Blue 220, Cool Turquoise 31, Cool Turquoise 30, Red Purple 570, Blue Violet 331, Rich Violet 650, Purple Blue 520, Winter Blue 341, Reddish Orange 400, Reddish Orange 401, Reddish Orange 402, Reddish Orange 403, Reddish Orange, 404, Quinacridone Red 410, Pale Yellow 550, Buttercup 290, Naples Orange 10, and Autumn Gold 620. This set contains Flesh Ochre 190, Flesh Ochre 191, Flesh Ochre 192, Flesh Ochre 193, Cool Tan (Green) 500, Cool Tan (Green) 501, Cool Tan (Green) 502, Gold Ochre 481, Gold Ochre 482, Warm Tan 471, Warm Tan 472, Warm Tan 473, Reddish Coral 102, Reddish Coral 103, Earth Orange 311, Earth Orange 312, Earth Orange 313, Earth Orange 314, Venetian Red 321, Venetian Red 322, Venetian Red 323, Brick Red 373, Raw Umber 160, Burnt Umber 110, and Naples Orange 12. This set contains Green Earth 280, Green Earth 281, Green Earth 282, Green Earth 283, Green Earth 284, Cool Grass Green 61, Cool Grass Green 62, Cool Grass Green 63, Soft Chromium Oxide 50, Soft Chromium Oxide 51, Blue Green 70, Blue Green 71, Blue Green 72, Blue Green 73, Blue Green 74, Chromium Oxide Green 350, Chromium Oxide Green 351, Chromium Oxide Green 352, Chromium Oxide Green 353, Chromium Oxide Green 354, Green Umber 210, Green Umber 211, Green Umber 212, Green Umber 213, and Green Umber 214. This set contains Earth Orange 310, Raw Umber 161, Geranium Pink 380, Raw Sienna 442, Raw Sienna 440, Dirt Yellow Green 530, Burnt Sienna 150, Burnt Sienna 152, Goldenrod 271, Goldenrod 273, Cobalt Blue 434, Purple Blue 522, Winter Blue 344, Winter Blue 340, Blue Violet 330, Soft Chromium Oxide 50, Light Yellow Green 120, Steel Blue 140, Steel Blue 142, Phthalo Blue 83, Dark Green 390, Dark Green 393, Chromium Oxide Green 350, Chromium Oxide Green 352, and Cool Grass Green 61. This set contains Venetian Red 320, Venetian Red 321, Venetian Red 322, Venetian Red 323, Burgundy 300, Reddish Coral 100, Reddish Coral 101, Reddish Coral 102, Reddish Coral 103, Reddish Orange 403, Dusty Rose 240, Dusty Rose 241, Dusty Rose 242, Dusty Rose 243, Dusty Rose 244, Quinacridone Red 410, Quinacridone Red 411, Quinacridone Red 412, Quinacridone Red 413, Reddish Orange 402, Geranium Pink 380, Geranium Pink 381, Geranium Pink 382, Geranium Pink 383, and Geranium Pink 384. This set contains Midnight Blue 540, Midnight Blue 541, Midnight Blue 542, Midnight Blue 543, Midnight Blue 544, Thunderstorm Violet 670, Thunderstorm Violet 671, Thunderstorm Violet 672, Thunderstorm Violet 673, Thunderstorm Violet 674, Thunderstorm Red 680, Thunderstorm Red 681, Thunderstorm Red 682, Thunderstorm Red 683, Thunderstorm Red 684, Gray Violet 230, Gray Violet 231, Gray Violet 232, Gray Violet 233, Earth Gray (Green) 421, Earth Gray (Green) 422, Thunderstorm Blue 640, Thunderstorm Blue 641, Thunderstorm Blue 642, and Thunderstorm Blue 643. This set contains Tropical Green 710, Tropical Green 711, Tropical Green 712, Tropical Green 713, Tropical Green 714, Turquoise Green 630, Turquoise Green 632, Turquoise Green 634, Green Earth 284, Cool Grass Green 60, Southwest Blue 721, Southwest Blue 722, Rich Violet 650, Fuscia 750, Fuscia 751, Fuscia 752, Fuscia 753, Warm Red 730, Warm Red 731, Warm Red 732, Earth Orange 310, Tropical Red Yellow 741, Tropical Red Yellow 742, Tropical Red Yellow 743, and Yellow Purple 561. This set includes Flesh Ochre 190, Flesh Ochre 192, Flesh Ochre 193, Burnt Sienna 151, Naples Orange 12, Gold Ochre 481, Gold Ochre 482, Warm Tan 470, Warm Tan 471, Warm Tan 472, Warm Tan 473, Pink Flesh Ochre 492, Earth Orange 313, Earth Orange 314, Reddish Coral 101, Venetian Red 322, Venetian Red 323, Burgundy 301, Burgundy 302, Burgundy 303, Raw Umber 161, Earth Gray (Green) 420, Earth Gray (Green) 422, Burnt Umber 113, and Dark Brown 581. This set contains Gray Violet 230, Cool Tan (Green) 501, Dark Red Brown 691, Brick Red 372, Burnt Sienna 150, Venetian Red 321, Brick Red 373, Light Yellow Green 121, Blue Green 72, Warm Greenish Gray 170, Earth Gray (Green) 420, Dirt Yellow Green 530, Dirt Yellow Green 531, Pale Yellow 551, Pale Yellow 552, Dark Green 392, Phthalo Blue 82, Cool Turquoise 30, Purple Blue 522, Cornflower Blue 222, Midnight Blue 543, Rose Violet 20, Cool Turquoise 34, Gernaium Pink 381, and Purple Gray 600. This set contains Raw Sienna 443, Warm White 1, Warm White 2, Light Yellow Green 122, Yellow Green 203, Naples Orange 10, Naples Orange 11, Naples Orange 12, Naples Orange 13, Raw Sienna 440, Raw Sienna 441, Raw Sienna 442, Butter Yellow 90, Butter Yellow 91, Butter Yellow 92, Goldenrod 270, Goldenrod 271, Goldenrod 272, Goldenrod 273, Goldenrod 274, Buttercup 290, Buttercup, 291, Buttercup 292, Buttercup 293, and Buttercup 294. This set contains Earth Orange 310, Earth Orange 315, Gold Ochre 480, Raw Sienna 440, Gold Ochre 483, Butter Yellow 90, Goldenrod 271, Goldenrod 273, Buttercup 290, Buttercup 292, Chromium Oxide Green 355, Cool Grass Green 63, Yellow Orange Green 362, Yellow Green 200, Light Yellow Green 122, Soft Chromium Oxide 50, Green Earth 283, Green Umber 211, Green Umber 213, Light Yellow Green 120, Dark Green 390, Dark Green 393, Chromium Oxide Green 350, Chromium Oxide Green 352, Cool Grass Green 61, Burnt Sienna 150, Burnt Sienna 152, Brick Red 370, Brick Red 374, Midnight Blue 540, Raw Umber 161, Gray Violet 232, Burgundy 300, Geranium Pink 380, Dusty Rose 241, Purple Blue 522, Winter Blue 344, Cornflower Blue 222, Cool Turquoise 32, Cool Turquoise 30, Blue Violet 330, Phthalo Blue 81, Steel Blue 141, Phthalo Blue 83, Cobalt Blue 434, Dirt Yellow Green 530, Steel Blue 140, Winter Blue 340, Cornflower Blue 220, and Blue Violet 332. This set contains Raw Umber 161, Earth Gray (Green) 422, Burnt Umber 113, Dark Brown 581, Earth Gray (Green) 421, Venetian Red 322, Venetian Red 323, Burgundy 301, Burgundy 302, Burgundy 303, Warm Tan 473, Pink Flesh Ochre 492, Earth Orange 313, Earth Orange 314, Reddish Coral 101, Gold Ochre 481, Gold Ochre 482, Warm Tan 470, Warm Tan 471, Warm Tan 472, Flesh Ochre 190, Flesh Ochre 192, Flesh Ochre 193, Burnt Sienna 151, Naples Orange 12, Quinacridone Red 412, Quinacridone Red 413, Steel Blue 141, Steel Blue 142, Gray Violet 233, Khaki 130, Khaki 131, Khaki 132, Reddish Orange 401, Reddish Orange 402, Earth Orange 314, Brick Red 373, Venetian Red 321, Venetian Red 322, Venetian Red 323, Raw Sienna 442, Brown Ochre 182, Earth Orange 311, Earth Orange 312, Earth Orange 313, Raw Umber 161, Burnt Umber 110, Burnt Umber 111, Burnt Umber 112, and Raw Sienna 441. This set contains Green Earth 284, Pale Yellow 550, Buttercup 290, Buttercup 294, Autumn Gold 620, Raw Sienna 440, Flesh Ochre 191, Flesh Ochre 194, Reddish Orange 400, Reddish Orange 401, Reddish Orange 403, Deep Red Purple 250, Quinacridone Red 410, Geranium Pink 380, Geranium Pink 381, Reddish Coral 102, Raw Umber 160, Cool Tan (Green) 500, Dark Brown 582, Dark Brown 584, Burnt Umber 111, Dark Blue (Purple) 511, Dark Blue (Purple) 512, Dark Blue (Purple) 513, Dark Blue (Purple) 514, Phthalo Blue 80, Phthalo Blue 83, Purple Blue 521, Purple Blue 523, Cobalt Blue 430, Cornflower Blue 224, Red Purple 570, Red Purple 572, Dusty Rose 240, Blue Violet 333, Blue Green 70, Blue Green 71, Chromium Oxide Green 350, Yellow Orange Green 360, Soft Chromium Oxide 52, Burgundy 300, Venetian Red 320, Reddish Coral 103, Venetian Red 324, Warm White 3, Warm Gray 459, Warm Gray 456, Warm Gray 454, Warm Gray 461, and Warm Gray 452.